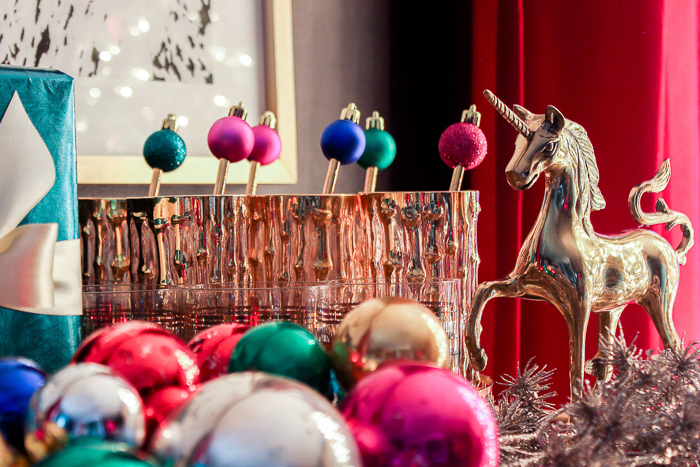 If you’re looking for a festive touch to your holiday party this year, make these Christmas ornament drink stirrers. It’s a simple DIY that will take about 10 minutes and costs around $10-$15. 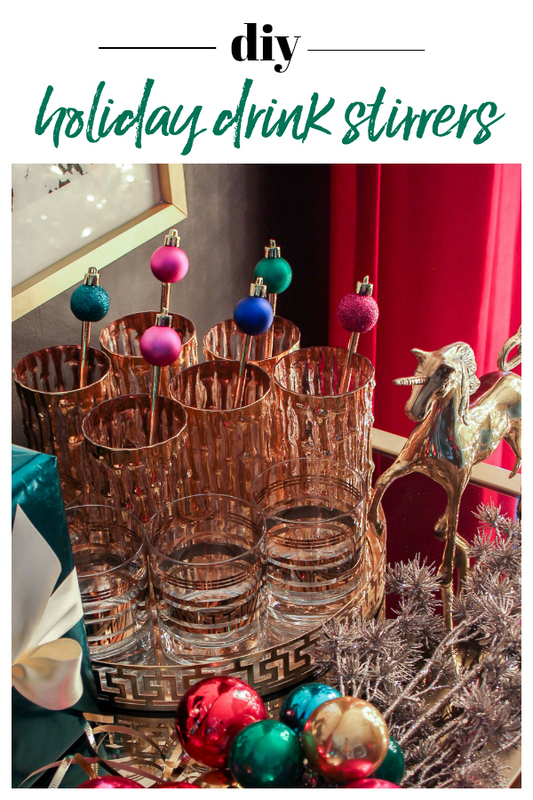 You might remember these fun little drink stirrers from last year’s Christmas home tour when they made their debut appearance. I love them just as much this year as I did last and maybe even more! You can customize these with colors and patterns that reflect your holiday decor too! Festive Paper Straws – I opted for gold ones, but you could go with any color that fits with your holiday decorations. Mini Ornaments – Mine came from Target. I believe you can find them at Michael’s and Hobby Lobby as well. Again, go with whichever colors/patterns you prefer. Using the X-Acto knife, cut a small hole in the bottom of each mini-ornament. You want the hole to be a little smaller than the end of the straw so that the ornament will fit snugly on the top of the straw. Place an ornament on one end of each straw. If you made your holes the right size, then you shouldn’t need anything else to hold the ornament onto the straw. If the ornaments are loose on the top of the straw, put a drop of hot glue either inside the ornament or just around the base of the ornament where it meets the straw to keep it in place. That’s it! Easy peasy, super simple. 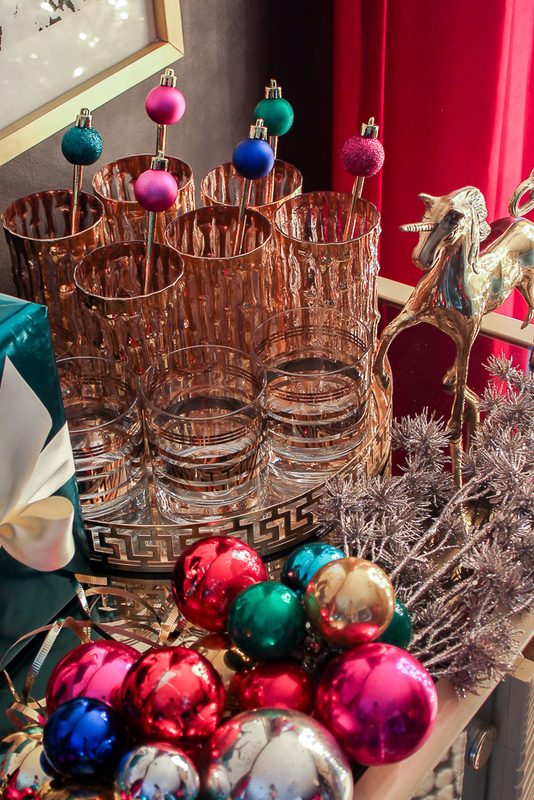 Have a designated spot for guests to drop their stirrers when they are finished with them. After the party, pull the ornament off the top of the straw and throw the straw away. 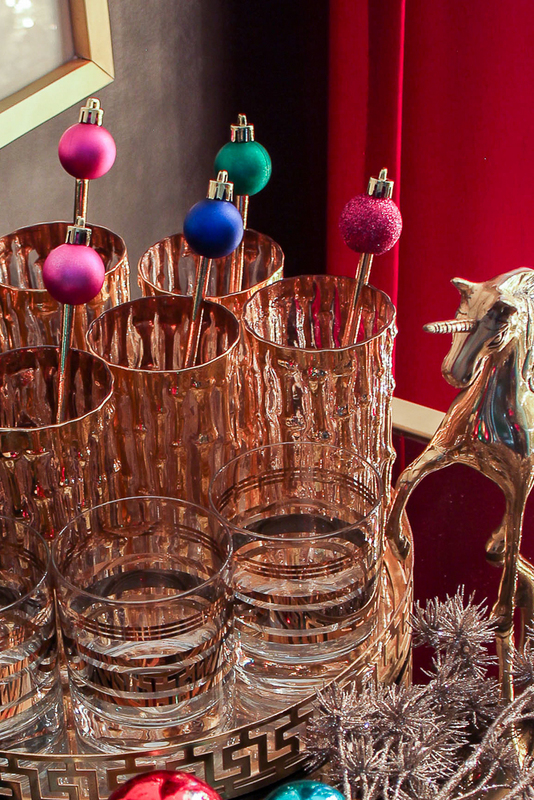 This way, to create more stirrers, all you’ll have to do is just pop the ornaments on new straws! I love that these also double as decor leading up the holidays. Cheers (complete with festive drink stirrers), friends! Want more great Christmas decorations that are easy to make? Use this tutorial to learn How to Make Ornament Clusters – super easy, but super gorgeous! DIY Record Tree Skirt – a fun twist on the traditional tree skirt! How to Make Character Stocking Holders – a great way to customize stocking holders for everyone in your family! I like these. Did you buy a bunch of the leopard paper last year? I love it also. Fun. Thanks, Stephanie! I did stock up on the leopard paper. I have two rolls left and they are like gold to me! haha! Do the straws hold up? Are they strong enough to actually stir a drink? These shiny gold straws seem to be a little more stronger than regular paper straws. I do think paper straws would be ok, but probably not for more than a couple of drinks. how fun and festive! thanks for the inspiration. I picked up a package of candy-cane-striped plastic straws that were heavy duty, I think they’d work nicely for this too. and thank you for sharing last week at our Encouraging Hearts & Home Blog Hop!